Tune in to watch as these five contestants go head-to-head in a series of bizarre and morally challenging competitions. Can the children navigate these sugary obstacles without giving into temptation? Who will be the last one standing and who will take a one way trip down the chocolate river? There's only one way to find out! Coming this Fall! Thursday nights at 9pm! It's so sweet, you'll have to wash it down with a glass of milk! At stake for the Sweet Life contestants is their own Chocolate Factory, a private army of Oompa Loompas*, and the chance to live every child's dream. Do not miss this groundbreaking show! 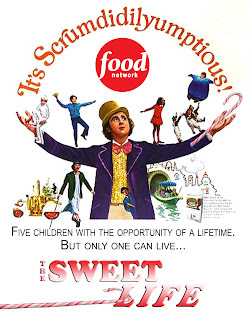 Hosted by the incomparable Willy Wonka and featuring celebrity guest judges like Anthony Bourdain, the Jelly Bean Craving Ghost of Ronald Reagan, and Macy Gray, this first season promises to be Scrumdidilyumptious! The Sweet Life is brought to you by Hershey's USA and the American Dental Association. I wonder who will be the first one to eat the grass. Who will be the first to eat the grass? Easy: Anthony Bourdain. With all the sugar-coated, reality junk food already on TV, this could be a real show - ha! Thank goodness for Tivo! lol...part of me wants to google this to see if it's real but ...i rather live in ignorance and be happy. lol...the one way chocolate river...the oompa loompa strike...the new haircut...chance of a lifetime but only one can live!....dental association of america....LOL. I hope someone from the food network is reading this. "Stop Making Movies About My Books!"